Five Over 50 Challenge #1: Something old, new, borrowed and blue | Is This Mutton? Introducing a new monthly feature, the Five Over 50 challenge! 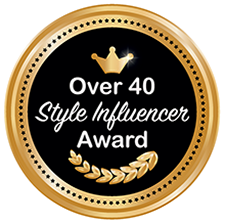 Four other bloggers, all over the age of 50, are joining me as we set each other a new challenge every month. The first one is "Something old, something new, something borrowed and something blue." 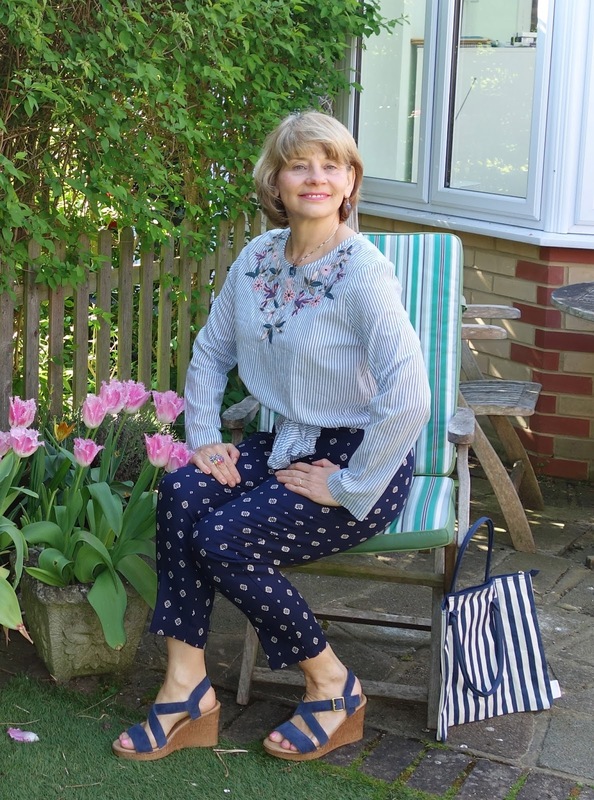 My "old" is my denim wedges which came from Marks and Spencer; my "new" is a stripey tie waist top from Marks and Spencer. 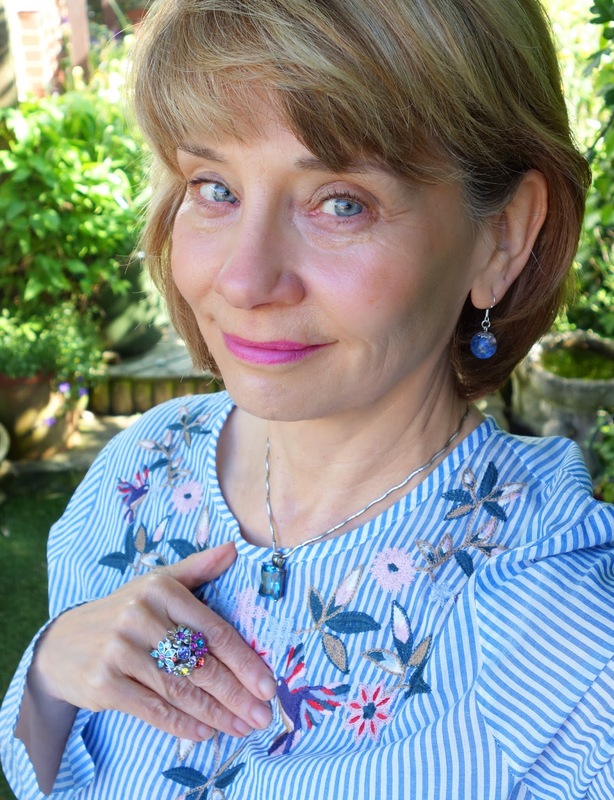 My "something borrowed" is the blue topaz pendant, and my "something blue" is a pair of Marks and Spencer print trousers (now put of stock). The cluster ring is an oldie from M&S. Yes folks, I am pattern mixing! Albeit in monochrome. I was very taken by the waist ties of the top. I remember years ago yearning for a top like this after I saw another girl wearing one. Usually they're a bit cropped and ride up, but good old M&S have made sure it sits neatly at the waist. No muffin alerts! 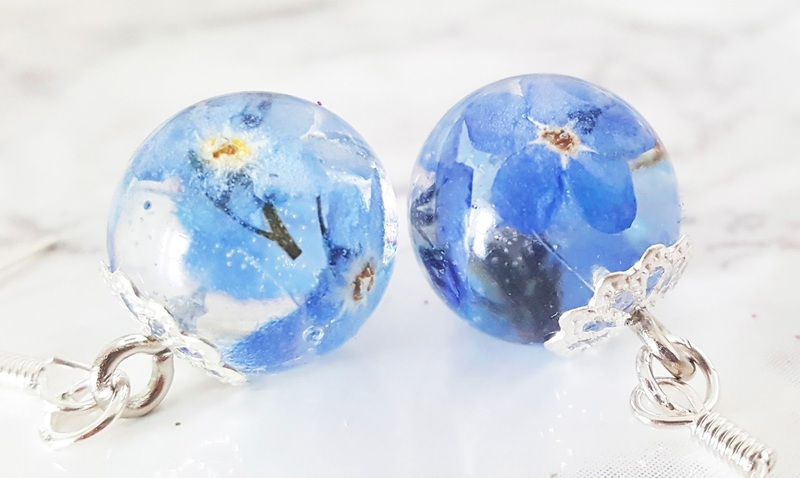 The earrings are real forget-me-nots encased in resin which I bought from Wishes on the Wind at Etsy. Let's see how the other ladies met the challenge. 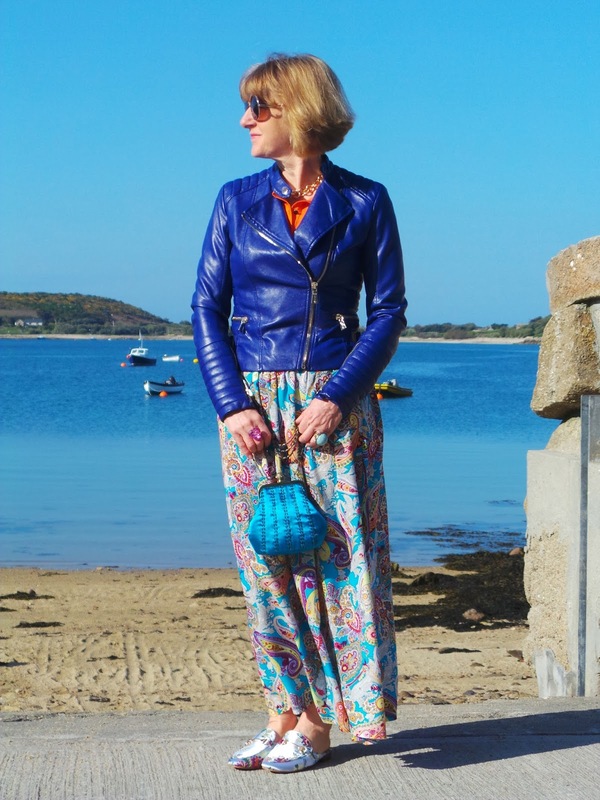 Look at the fabulous Isles of Scilly blue sky in this photo from Anna of Anna's Island Style. Her Something Old is a paisley maxi skirt, the new is the embroidered mules, the borrowed - a cute satin handbag borrowed from her sister and the blue, a biker jacket. Ashley from LazyDaisyJones is sporting gorgeous fringed jeans as her "blue." Her borrowed is a t-shirt from her son; her old is a Chanel bag, and her new is these fabulous gold mules. 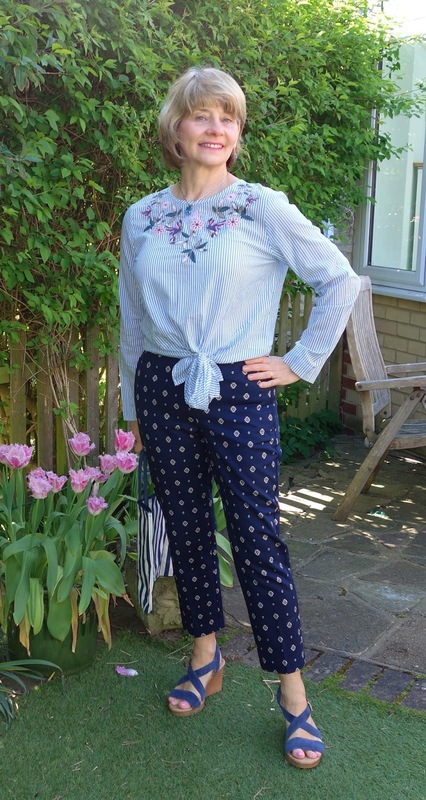 Laurie from Vanity And Me is wearing a New shirt from Hawes Curtis; her old is cream trousers from Next, her borrowed is a bangle and handbag, and her blue is the shirt. Jacqui from Mummabstylish has a lovely location to showcase her new, a jumpsuit from New Look. Her old is a jacket from H&M, her blue is a bag from New Look, and her borrowed is a necklace on loan from her daughter. Sharing this post with #IwillwearwhatIwant at Not Dressed As Lamb, Visible Monday at Not Dead Yet Style, Turning Heads at Elegantly Dressed and Stylish, and Style with a Smile at Style-Splash. I only bought those trousers a week ago and they're already out of stock! Maybe they'll get more in. Thanks for taking part in the challenge! Looking forward to the next one. Wow, a lot of blue always goes down well. Those wedges look so comfy. It is a lot of blue, I probably cheated a bit because "something blue" could easily have applied to all of my outfit! And to think I hardly ever wear blue normally! Gail that top is adorable, blue is my favourite colour therefore so much for me to love here! Thank you so much for organising this challenge I can see its going to be lots of fun! I think I will get a lot of wear out of it this summer! I've never worn a lot of blue so here goes....yes the challenge is going to be fun, great working with you gals! Thanks Patti, you're too kind! I love that your are mixing your prints, Gail!! It's done perfectly and you look magnificent! Thanks Jodie, I didn't set out to, it just happened!! Maybe next time with different colors! Everyone looks lovely and those wedge heels are something I have been looking for! 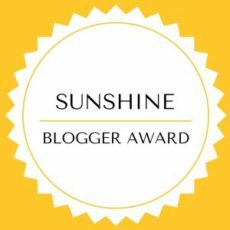 Gail, thanks for firing us up with this new challenge, and for introducing me to some new bloggers too. Your interpretation is fresh and youthful, and hey I love that cute little ring too. Thanks Anna, great to have you on board - your outfit is so edgy. I think you may inspire me to try new things. I really like your outfit! The tied top is so pretty - I love the embroidery. And the pattern mixing turned out very nice. Looking great! Well done to all the ladies, you all look amazing and all completely different styles. I usually wear plain colours or quiet patterns but you girls show how being bolder looks fabulous. Thanks for linking up to Top of the World Style. Your outfit is great. I love the mix of pattern! Im only now starting to add more blues to my closet! I love color but don't know why I havent steered toward blue. I love the outfit, top especially and the earrings, necklace, ring are so pretty on you. Fun challenge and I love the different interpretations!